Secretary Johnson to Detroit auto show visitors: Are you ready for REAL ID? Secretary of State Ruth Johnson has announced that attendees of the North American International Auto Show (NAIAS) in Detroit can stop by her office’s display on the Cobo Center concourse to learn more about upcoming REAL ID requirements during the public show. Beginning Oct. 1, 2020, the federal government will not allow Michigan residents carrying a driver’s license or ID card that does not comply with the federal REAL ID Act to board domestic flights, or enter certain federal facilities unless they have another accepted ID document. Beginning Jan. 22, REAL ID flight rules go into effect nationwide; however, because Michigan has a compliance extension, all residents who have a driver’s licenses and ID cards will be accepted through Oct. 1, 2020. To obtain a compliant card, residents will need to bring a certified birth certificate or another approved document to any Secretary of State office. People whose name has changed since birth will need to bring a name-change legal document(s), such as marriage license or court order, or show a valid U.S. passport showing the person’s current name. The world-class North American International Auto Show at Cobo Center in Detroit features the Charity Preview, the largest single-night charity event in North America, on Jan. 19. The public show begins Saturday, Jan. 20 and runs through Sunday, Jan. 28. 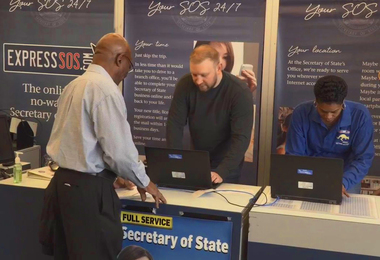 The full-service Secretary of State Mobile Office will be at the auto show to register people to vote, join the organ donor registry, renew licenses and plates, and much more. The Mobile Office will be on the concourse near the Hall B entrance and office hours will be from 9 a.m. to 8 p.m. on weekends and noon to 6 p.m. on weekdays. On Sunday, Jan. 28, the office will close at 7 p.m. The federal REAL ID standards for driver’s licenses and ID cards were created in the wake of the Sept. 11, 2001 terrorist attacks based on recommendations from the 9/11 Commission. The Act sets document and security standards for the production and issuance of driver’s licenses and ID cards, including the use of features to prevent illegal copying or altering. The 2018 Winter Olympic Games begin on Feb. 9 in South Korea and you can show your support for Team USA with an Olympic license plate. For every plate sold, $25 of the $35 purchase price, and all $10 for renewals, goes to the U.S. Olympic Education Center at Northern Michigan University. Monica Drake, a communications representative for the Michigan Office of Performance and Transformation recently followed James Fackler, an assistant administrator in the Customer Service Administration of the Department of State, for a day to learn more about what the department's team does. Secretary of State Ruth Johnson was pleased to visit with Oakland University President Dr. Ora Pescovitz and the OU government/state relations team in Lansing on Jan. 10. Secretary Johnson announced recently that Secretary of State offices collected more than 10,000 pounds of food and nearly $2,000 during the 2017 Harvest Gathering food drive. Many offices also received health care items for donation. Collected items were distributed to local food banks.